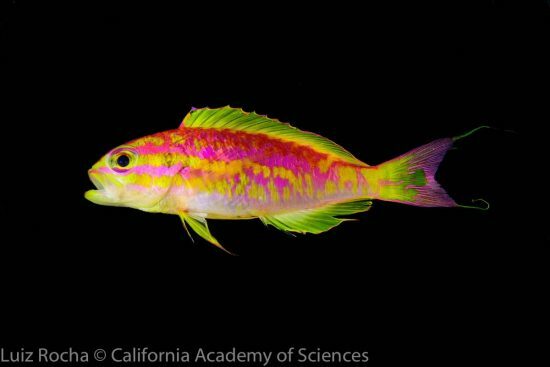 Named for Aphrodite, the Greek goddess of love and beauty, a new species of fish that has so far only been observed in a remote Brazilian archipelago enchants its discoverers from the California Academy of Sciences. They recently described the new species in an article in the journal Zookeys. 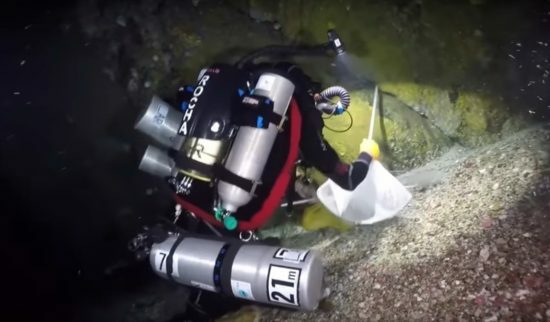 On an expedition into the remote Brazilian archipelago of St. Paul's Rocks, divers discovered a new reef fish species. The fish, first sighted at a depth of 120 meters below the surface of the sea, inhabits rocky crevices in the reefs of the twilight zones and is nowhere to be found anywhere else in the world. 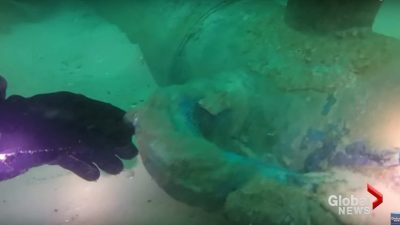 The divers were so captivated by the discovery that they did not notice that they were approached by a huge, usually extremely harmless, sixgill shark. The approach of the shark is captured in a UW movie (see also Video - link below). 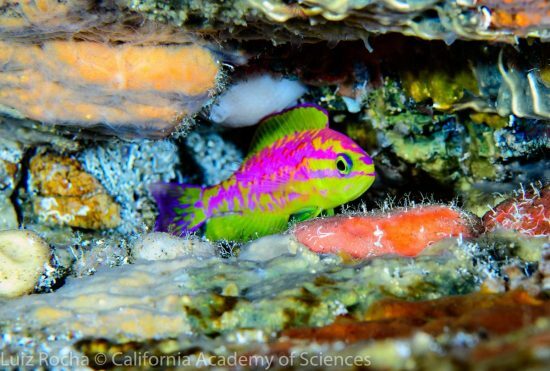 "This is one of the most beautiful fish I've ever seen, it was so adorable that we ignored everything else," Dr. Luiz Rocha, Curator of Fish at the California Academy of Sciences. The researchers named the fish for the Greek goddess Aphrodite. His scientific name is Tosanoides aphrodite. "Fish from the dusk zone are usually pink or reddish," the researchers said. 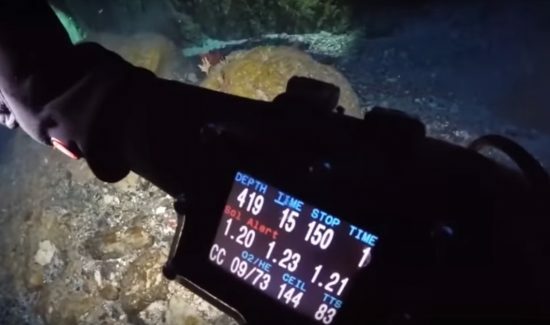 "Red light does not penetrate these dark depths and makes the fish virtually invisible, unless they are illuminated by a light like the one we wear while diving." The males of the newly discovered fish species are equipped with alternating pink and yellow stripes, while the females have a blood-orange colour. The “New Dweller of the Deep” is a remarkable testimony to the vast ocean habitats that are still unexplored. The divers are part of a deep-sea research team venturing to the twilight reefs - mysterious coral habitats, at depths of 60 to 150 meters. In these deep reefs, the animals live in partial darkness - beyond the depths of recreational divers. St Paul's Rocks is located almost 600 miles off the coast of Brazil, so remote that the team had to use the research vessel "M / V Alucia" as a base for exploring the archipelago. Due to the isolated location of the region, many of the species living there are nowhere else found on Earth. 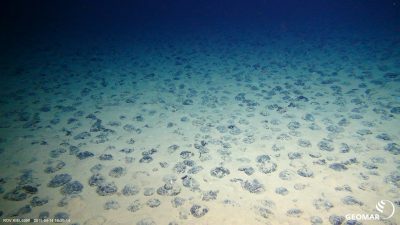 "In a time of global coral reef crisis, it's critical to learn more about unexplored habitats and their colorful inhabitants to understand how to protect them," said Rocha. Link to the study: https://zookeys.pensoft.net/articles.php?id=27382.